White House Senior Adviser Jared Kushner listens during President Donald Trump's joint news conference with German Chancellor Angela Merkel in the East Room of the White House in Washington, March 17, 2017. 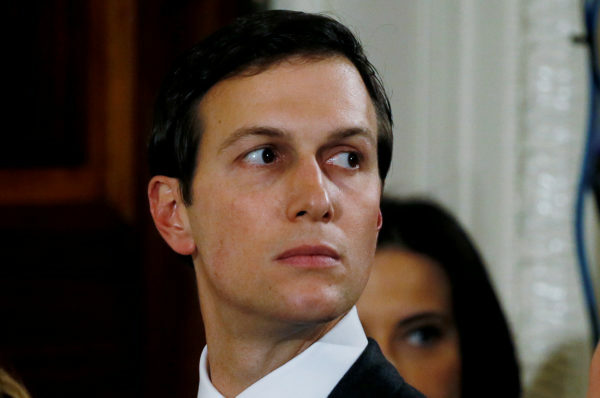 Kushner writes that his first meeting with a Russian official was in April 2016 at the Mayflower Hotel in Washington, where Trump delivered a major foreign policy speech, the execution of which Kushner says he oversaw. Kushner writes that he attended a reception to thank the event’s host, Dimitri Simes, the publisher of The National Interest, a foreign policy magazine, where Simes introduced Kushner to four ambassadors, including Kislyak. In fact, Kushner goes on to note that on Nov. 9, the day after the election, when the campaign received a congratulatory note from Russian President Vladimir Putin, Kushner tried to verify it was real and could not remember Kislyak’s name. “So I sent an email asking Mr. Simes, ‘What is the name of the Russian ambassador?’” Kushner writes. Kushner also describes attending a June 2016 meeting organized by his brother-in-law, Donald Trump Jr., with a Russian attorney. He says it was listed on his calendar as “Meeting: Don Jr. / Jared Kushner.” He writes that he arrived at the meeting late, and when he got there the Russian lawyer was talking about a ban on U.S. adoptions of Russian children. Kushner also details two interactions with Russian officials during the transition period, before Trump was sworn in as president on Jan. 20. The first, on Dec. 1, was a meeting with Kislyak at Trump Tower in New York, which retired Lt. Gen. Michael Flynn, who would become the president’s national security adviser, also attended. The second was on Dec. 13, when Kushner met with Sergey Gorkov, a banker with “a direct line to the Russian President,” at the urging of Kislyak. The meeting lasted 20 minutes to 25 minutes, Kushner writes, and he presented two gifts — a piece of art from Nvgorod, the village where Kushner’s grandparents were from in Belarus, and a bag of dirt from there.